Presents under the tree, huddling together for those big family photos, putting on those goofy clothes that only come out once a year, taking time to appreciate one’s good fortune. It’s how most people spend Dec. 25, and athletes are no exception. 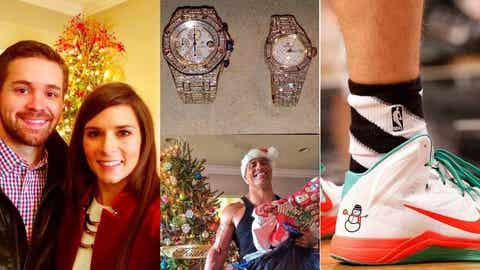 From the players on the court to the athletes playing Santa at home, here’s a smattering of the best the sports world had to offer this Christmas. Merry Christmas Patrick, that was for you. And on the court, the players certainly were festive. Brooklyn Nets power forward Mirza Teletovic’s snowman sneakers. Lebron James does the green & red. So does Dwight Howard . . . and then some. 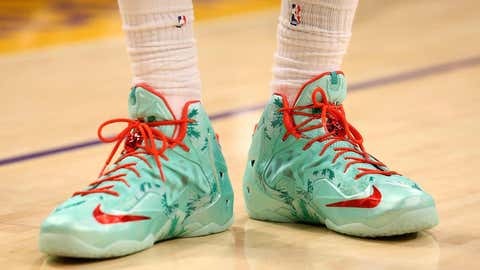 These new Christmas duds certainly caught the basketball world’s eye — and that world didn’t like what it saw. 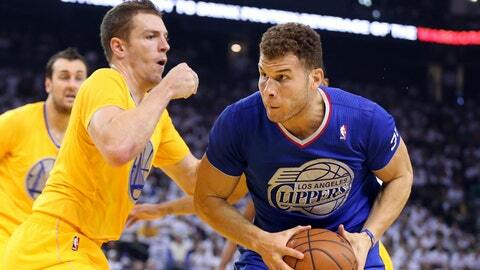 The Warriors’ David Lee defends the Clippers’ Blake Griffin in their Christmas best — the NBA’s special sleeved uniforms. Don’t worry, Lee didn’t hit Griffin; but Griffin was ejected after a couple of seemingly minor tussles. At least Kobe & LeBron showed the love. And this guy sure loves J.R. Smith. And LeBron’s kids love acting like their dad. Christmas cards with pictures of relatives you barely know clogging your mailbox? Bet you would mind seeing one of these. Athletes are big on family, too . . . and getting dressed up in stuff they probably wouldn’t ever wear out with buddies. And then those big family photos. But what beats kids . . . and pets? Boys at whosville universes studios We had a blast there. OK, maybe better halves . . . and more pets. But ultimately, Christmas is all about the presents. And sometimes the presents aren’t FOR you . . . they ARE you. Don’t you wish Floyd Mayweather was your Santa? 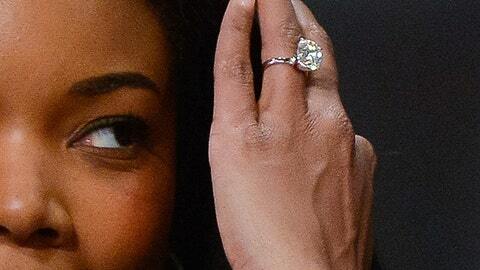 Gabrielle Union was at Staples Center to watch fiance Dwyane Wade and his Miami Heat face the Lakers — and to show off her rock.